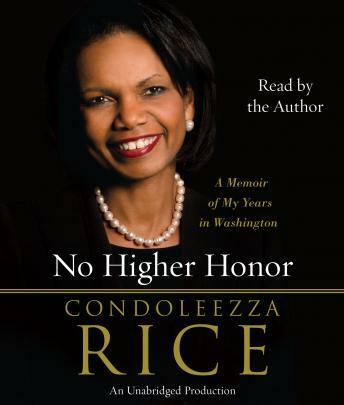 Listen to "No Higher Honor: A Memoir of My Years in Washington" on your iOS and Android device. From one of the world’s most admired women, this is former National Security Advisor and Secretary of State Condoleezza Rice’s compelling story of eight years serving at the highest levels of government. In her position as America’s chief diplomat, Rice traveled almost continuously around the globe, seeking common ground among sometimes bitter enemies, forging agreement on divisive issues, and compiling a remarkable record of achievement. A native of Birmingham, Alabama who overcame the racism of the Civil Rights era to become a brilliant academic and expert on foreign affairs, Rice distinguished herself as an advisor to George W. Bush during the 2000 presidential campaign. Once Bush was elected, she served as his chief adviser on national-security issues – a job whose duties included harmonizing the relationship between the Secretaries of State and Defense. It was a role that deepened her bond with the President and ultimately made her one of his closest confidantes. With the September 11, 2001, terrorist attacks, Rice found herself at the center of the Administration’s intense efforts to keep America safe. Here, Rice describes the events of that harrowing day – and the tumultuous days after. No day was ever the same. Additionally, Rice also reveals new details of the debates that led to the war in Afghanistan and then Iraq. The eyes of the nation were once again focused on Rice in 2004 when she appeared before the 9-11 Commission to answer tough questions regarding the country’s preparedness for – and immediate response to – the 9-11 attacks. Her responses, it was generally conceded, would shape the nation’s perception of the Administration’s competence during the crisis. Rice conveys just how pressure-filled that appearance was and her surprised gratitude when, in succeeding days, she was broadly saluted for her grace and forthrightness. From that point forward, Rice was aggressively sought after by the media and regarded by some as the Administration’s most effective champion. In 2005 Rice was entrusted with even more responsibility when she was charged with helping to shape and carry forward the President’s foreign policy as Secretary of State. As such, she proved herself a deft crafter of tactics and negotiation aimed to contain or reduce the threat posed by America’s enemies. Here, she reveals the behind-the-scenes maneuvers that kept the world’s relationships with Iran, North Korea and Libya from collapsing into chaos. She also talks about her role as a crisis manager, showing that at any hour -- and at a moment’s notice -- she was willing to bring all parties to the bargaining table anywhere in the world. No Higher Honor takes the reader into secret negotiating rooms where the fates of Israel, the Palestinian Authority, and Lebanon often hung in the balance, and it draws back the curtain on how frighteningly close all-out war loomed in clashes involving Pakistan-India and Russia-Georgia, and in East Africa. Surprisingly candid in her appraisals of various Administration colleagues and the hundreds of foreign leaders with whom she dealt, Rice also offers here keen insight into how history actually proceeds. In No Higher Honor, she delivers a master class in statecraft -- but always in a way that reveals her essential warmth and humility, and her deep reverence for the ideals on which America was founded.